...through wiping, we learn. : Countdown to Warlords : Cho. Thinking back over the last two years, I did enjoy Mists. Most of the quests where nice, some patch-stories where very good. The raids where mostly entertaining...except for the bugs. The Boss mechanics were mostly quite interesting. All in all I rather enjoyed this Expansion. There is just one Panda, that just keeps pushing all the wrong buttons. I think he is personally responsible for us getting in trouble with half of the raidbosses. 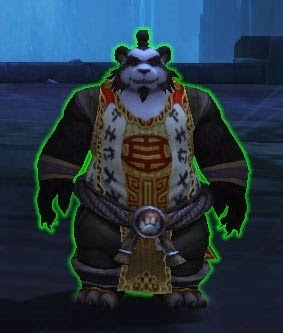 He is also THE NPC, that in my humble opinion, is the embodiement of Mists of Pandaria. Keep on writing Cho, of all the things we did. I do not expect us to sea each other soon, considering you are so bound to that island in the mist. Have a good life, so long, and thank you for the words.